Is Robert Durst a psychopath? HBO’s The Jinx subject is suspected of murder. Can You Recognize a Psychopath? TV doesn’t do justice to this serious, dangerous, neurologically distinct condition. 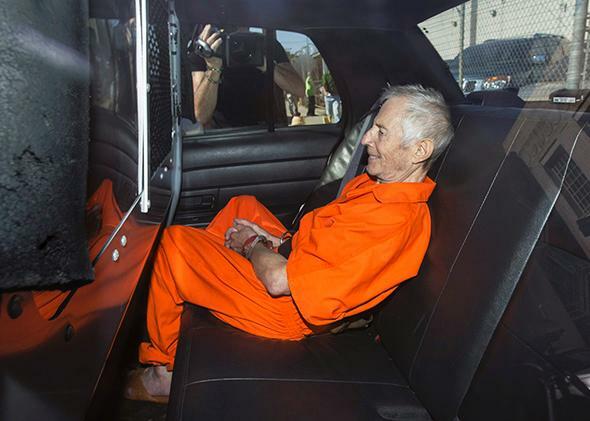 Robert Durst, pictured in a police vehicle as he leaves a courthouse in New Orleans on March 17, 2015, was arrested on a charge of first-degree murder on Saturday and is believed by many, including his own brother, to be a psychopath. On Saturday, Robert Durst was arrested by the FBI on a charge of first-degree murder. He is suspected of killing his friend Susan Berman 15 years earlier. This is not the only time people close to Durst have come to grief under suspicious circumstances, as detailed in HBO’s miniseries The Jinx. While Durst has yet to face a court of law, in the court of public opinion there seems to be little doubt that he fits the mold of psychopathic killer, a belief shared by his own brother Douglas Durst. Psychopathy is primarily diagnosed by a semi-structured interview administered by an expert, so we can’t know yet whether Robert Durst would actually qualify as a psychopath. But we do know that psychopaths exist and that they do considerable societal harm. If Durst really did kill Berman and his first wife, Kathie Durst, as well as the neighbor he admitted killing (he claimed it was in self-defense), one wonders: Why would someone do something so awful? Why would someone whose world is his oyster throw it all away like that? Why ruin other people’s lives along with his own? It seems to make no sense at all. Assuming for the sake of argument that he is a psychopath, the short answer is that psychopaths can’t help it. Laws are built on the notions that everyone is fundamentally the same, that everyone is equal, and that we are ultimately all the same inside. But neuroscience has shown time and again that this is not entirely true. While a lot of ink—and sometimes blood—has been spilled over superficial distinguishing characteristics such as race or gender, the diversity that really matters is on the inside, on the level of the brain. It’s just that this dramatic neurodiversity is hidden by the skull, which is completely opaque. But modern neuroscientific methods allow a peek inside. A striking example of how such brain differences can matter comes from the neuroscientific study of psychopathy. Kent Kiehl and colleagues have scanned the brains of hundreds of psychopaths—many of them in prison—and found compelling evidence that psychopathy is not a lifestyle choice but rather a brain disorder. Kiehl’s research shows that a network of brain regions including the amygdala, cingulate, and orbitofrontal cortex, which are involved in emotional processing as well as the control of social behaviors and together form the “paralimbic system,” is particularly affected in psychopathy. One study showed that, in incarcerated men, stronger psychopathic tendencies are associated with a decrease of gray matter in these regions. In other words, the brains of psychopaths are physically different from those of nonpsychopaths in areas critical for the control of emotions and regulation of social behavior. This difference in the neural substrate manifests in many ways. The first thing to note is that just like real-life drowning doesn’t look anything like drowning on TV, the psychopath next door will have little in common with the psychotic murderers that the media loves to portray. Because psychopaths hide behind a “mask of sanity,” most of their victims will be entirely blindsided by their reckless behavior. Rather than giving dramatic or obvious signals of danger, psychopathy is primarily characterized by diminished emotional affect and antisocial tendencies, manifesting as pathological lying, lack of empathy, lack of remorse, impulsivity, lack of long-term planning, and other forms of manipulative and irresponsible behavior. Contrary to popular belief, violence is explicitly not a crucial part of the condition. And if being a serial-killing axe murderer is not a critical part of psychopathy, it should be readily apparent that the condition is much less rare than commonly assumed. Because psychopaths don’t tend to seek out treatment, it is challenging to estimate their prevalence, but credible studies put the number of individuals with psychopathic tendencies at more than 1 million in the United States alone. Given that psychopathy is frequently undetected, two critical research findings are particularly chilling. Generally speaking, psychopaths have a much harder time learning from punishment than nonpsychopaths do. And they also show a diminished anticipatory physiological response—in particular electrical skin conductance, a measure of sweating—to the announcement of threats such as loud, unpleasant sounds. Much of our society is built around the supposition that people do learn from punishment and that potentially harmful behavior can be deterred by the anticipation of punishment. Indeed, much of the management of international affairs is built around the same set of beliefs. What if this can no longer be assumed to be the case once a psychopath is in charge, be it in the role of citizen, boss, or world leader? All of this raises the question of whether our civilization is a “soft target” for psychopaths. We might well be growing more tame as a species on the whole, but the destructive potential of our weaponry has only increased. What if a psychopathic world leader had access to a nuclear arsenal? The nature of his condition would make it hard for him to control his psychopathic tendencies, and deterrence would probably be ineffective at the same time. Such a scenario conjures up truly apocalyptic visions. Closer to home, our increasingly urbanized, increasingly online lives give psychopaths new ways to pursue their goals with indifference toward the suffering of others. Psychopaths exploit anonymity, and our vulnerability to them may be amplified by the sharing economy (Uber, Airbnb, et al.). It is crucial that neuroscience develop tools to reliably detect psychopaths. My prediction is that this will happen, but then what? What are we to do with them? Because psychopaths so often make others suffer, it is tempting to cast blame on their kind, and condemn them in the harshest possible way. We must find ways to take the condition seriously without excusing psychopathic behavior. The condition really does pose an ethical conundrum. If psychopaths can’t help it, does this excuse their behavior, which is typically as atrocious as it is remorseless? Our legal system is certainly based on the assumption of rational actors that can distinguish right from wrong and act accordingly—and hence be held accountable. But what if research shows that there are some people—psychopaths—who might know right from wrong, but due to the way their brains work don’t (or can’t) care? Regardless of whether we can muster the ethical framework to do so, psychopathy is a phenomenon that needs to be reckoned with, if only due to the sheer amount of suffering inflicted on society by psychopaths, whether they can help it or not. Many—if not most—psychopaths end up in prison, making it the default treatment our society allots to psychopaths. This is clearly inadequate in light of the ethical challenges as well as the fact that they inflict quite a bit of suffering before they are finally caught—and not all of them are caught. In the long term, there is no way around developing more effective treatment options. There are some promising new approaches, such as “decompression treatment,” which instead of using a punishment model uses escalating positive reinforcement. But most currently available treatments are woefully inadequate. In the meantime, although it might sound cliché, it is critical to raise awareness of the condition. If people knew what psychopaths actually behaved like, they might be less likely to fall prey to one. For instance, Durst himself, according to his brother Douglas, killed seven dogs, all named Igor, before allegedly killing his first wife. But regardless of whether Robert Durst is a psychopath or not, we need to reckon with their existence or suffer the consequences. Because psychopaths are out there, doing as psychopaths do.